T. a. pratincola (Bonaparte, 1838) –উত্তৰ আমেৰিকা, দক্ষিণ কানাডা,মেক্সিকো. Tyto alba contempta (Hartert, 1898) – পশ্চিম ভেনিজুৱেলা, কলম্বিয়া ) south to Peru. Includes stictica. 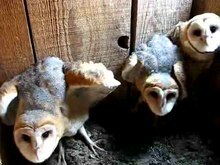 Three Barn Owls threatening an intruder. ↑ "Barn Owl Fact Sheet, Lincoln Park Zoo"
BirdLife International (BLI) (2008). Tyto alba. In: IUCN 2008. IUCN Red List of Threatened Species. Downloaded on 19 December 2008. British Trust for Ornithology (BTO) (2009): BirdFacts – Barn Owl. Version of 2009-JUN-25. Retrieved 2009-OCT-31. El Espectador (2011): Luis Moreno, multado con 26 millones de pesos por patear una lechuza [Spanish]. Version of 2011-APR-27. Retrieved 2011-APR-27. n-tv (2011): Fußballprofi tötet Maskottchen – 10.000 Euro Strafe für Eulen-Tritt [German]. Versuon of 2011-APR-28. Retrieved 2011-APR-28. 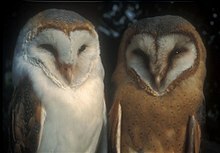 Pennsylvania Game Commission (PGC) (2008): Barn Owl Conservation Initiative. Version of 2008-AUG-25. Retrieved 2008-OCT-03. 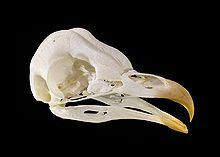 Bachynski, K. & Harris, M. (2002): Animal Diversity Web: Tyto alba (barn owl). Retrieved 2006-9-21. Barn Owl - Species text in The Atlas of Southern African Birds.